Venezuela is running out of money and time. The country's central bank only has $11.9 billion in reserves, down sharply from $30 billion in 2011. A few large debt payments are coming due soon. Starting in October, Venezuela owes a total of $4.7 billion in a series of payments. "Within a year they're going to run out of money," says Russ Dallen, an expert on Venezuela's debt and managing partner at Caracas Capital, an investing firm in Miami. Dallen pointed out that the country has been almost "suicidal" in its focus on making debt payments. Experts' guesses vary over exactly how much time Venezuela has before it runs out of cash. But all agree that at this rate, Venezuela does not have enough reserves to make all its payments for the next two years. Much of Venezuela's reserves are in gold, some of which the country has shipped to Switzerland this year to help repay its debts. As of May, Venezuela had $7.4 billion of its reserves in gold. However, it sent more gold in June, Swiss data shows. "It doesn't seem that Venezuela is going to be able to make all payments for next year," says Mauro Roca, a Latin American economist at Goldman Sachs (GS). "The probability for default is much higher for next year than this year." It is a dire situation and ironic for a country that sits on the world's largest oil reserves. It's true that oil prices have dropped dramatically and Venezuela hasn't been able to earn enough money for its oil. But whatever money Venezuela earns from its oil is going to pay down its debts to lenders like China, bondholders, oil drilling companies and importers. Even oil drilling companies are starting to cut business in Venezuela. For instance, in April, Schlumberger said it would reduce operations in Venezuela due to unpaid bills. It's also one of the key reasons why the country's oil production has plunged to 13-year lows. 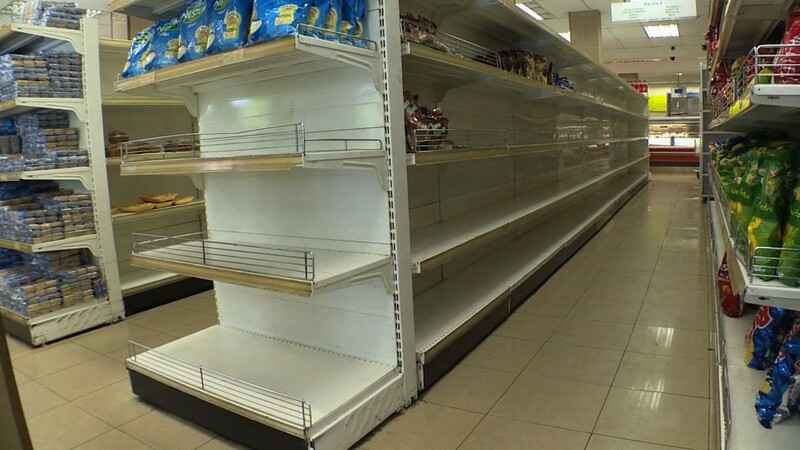 According to Bank of America (BAC), Venezuela's imports -- which include food and medicine -- declined between 40% and 45% in the first five months this year compared to the same time a year ago. (There isn't reliable government data on imports). "It's a dramatic cut...they're making a big effort to pay the debt," says Sebastian Rondeau, an economist at Bank of America. He estimates that Venezuela can make debt payments until April of next year. "Then the second half of next year is going to be very complicated." There is still a chance that Venezuela could default this year. Venezuelan officials are currently working with bondholders of the country's state-run oil company, PDVSA, to exchange short-term debt, which is due in October and November, with longer-term debt. If bondholders don't agree, it could be a problem. "It would just kick the can further down the road...we still think the government is highly likely to default over the next two years, if not in the next six months," says Edward Glossop, an economist at Capital Economics, a research firm. But China may be coming to Venezuela's rescue. China is reportedly in talks to give Venezuela a one-year grace period on repaying its debt and only make interest payments. Since 2007, China has loaned Venezuela $65 billion and Venezuela has been slowly repaying that via oil shipments. Last year, Venezuela shipped 579,000 barrels of oil per day on average to China, an audited financial statement from the country's oil company shows. It appears China may now cut Venezuela some slack, so it can sell oil to bring in some money. Regardless of a new debt deal or temporary relief from China, experts say Venezuela's current path isn't sustainable. "It's like saying how long can you hold your breath under water?" says Dallen.